The social exclusion that globalisation seems to foster, and the widening gap it facilitates between rich and poor in developed as well as in developing nations, can no longer be ignored. Accordingly, the concept of social rights, originally introduced in the European Social Charter of 1961, has once again come to the forefront of international and comparative labour law. The book contains the reports of the International Conference held in Brussels, on 9 May 2000, which was organised by The Royal Flemish Academy of Belgium and the Society for Social and International Cooperation, in collaboration with The Council of Europe, The European Union, and The International Labour Organisation. The goal of this Conference was to investigate ways of building bridges between economic and technological market-driven developments on the one hand, and fundamental necessities of a civilised and decently human society on the other. 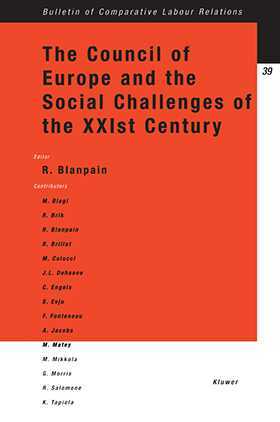 The first paper seeks to identify the social challenges confronting European citizens in the XXIst Century. Then follow three reports by eminent members of the Committee of Independent Experts of the Council of Europe describing the rights contained in the European Social Charter, what the Charter means for Central and Eastern European countries, and the relationship between the Charter and the European Union.